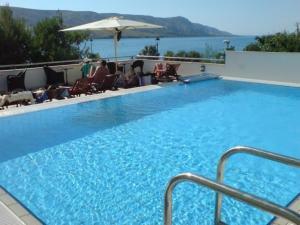 Set 40 km from Zadar and 18 km from Novalja, Apartment Pag 11358d offers accommodation in Pag. Guests benefit from balcony. There is a seating area, a dining area and a kitchen. A TV is available. There is a private bathroom with a shower. Mali Lošinj is 47 km from Apartment Pag 11358d, while Lopar is 49 km from the property. Zadar Airport is 46 km away. When would you like to stay at Apartment Pag 11358d ? A security deposit of EUR 100 is required upon arrival for incidentals. This deposit is fully refundable upon check-out and subject to a damage inspection of the accommodation. A security deposit of €100.00 is required upon arrival for incidentals. This deposit is fully refundable upon check-out and subject to a damage inspection of the accommodation. Each day we'll check prices and send you an email for your selected dates at Apartment Pag 11358d. If you don't have specific dates but would like to check prices for say next weekend or say next month we can check the price too. Click to write a review and share your experience of Apartment Pag 11358d with other travellers.